Little Weirdos: Mini figures and other monster toys: Micro alien figures group shot: Funny Fringes and more! 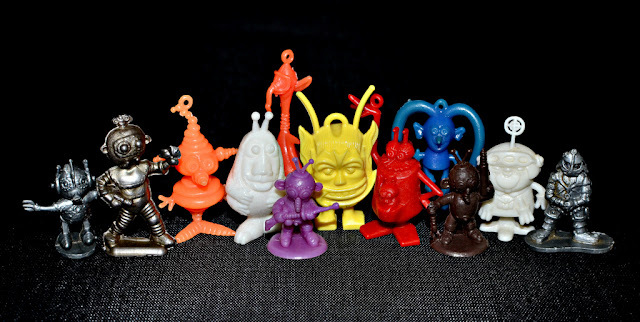 Micro alien figures group shot: Funny Fringes and more! The orange, red and blue figures are Funny Fringes R&L cereal premiums. The yellow guy in the middle is a Martian Fink vending machine figure. The two white figures are Raja premiums. The same characters were also used among those released as Screaming Yellow Zonkers space creatures premium figures. The purple and brown ones are Giant brand aliens. I'm not too clear on how and when they were sold. The silver ones on each end are extra mini versions of alien/robot characters that have been released in many different forms over the years. The other shiny guy (second from left) is an unidentified vending machine alien. I've got a bunch more Funny Fringes that are really cool and worthy of a post, but I think I'll hold out on taking a pic of them because I only need one more to complete a set of 15 ("Turninge"--anyone got one to part with?). As a child I had a huge number of the "Giant brand" aliens. For years I thought I had misremembered them as could never find them. This was early 70s. They could have come from a cousin as hand me downs and been even made earlier. Too bad you didn't hang onto them! They seem to be in pretty high demand today.